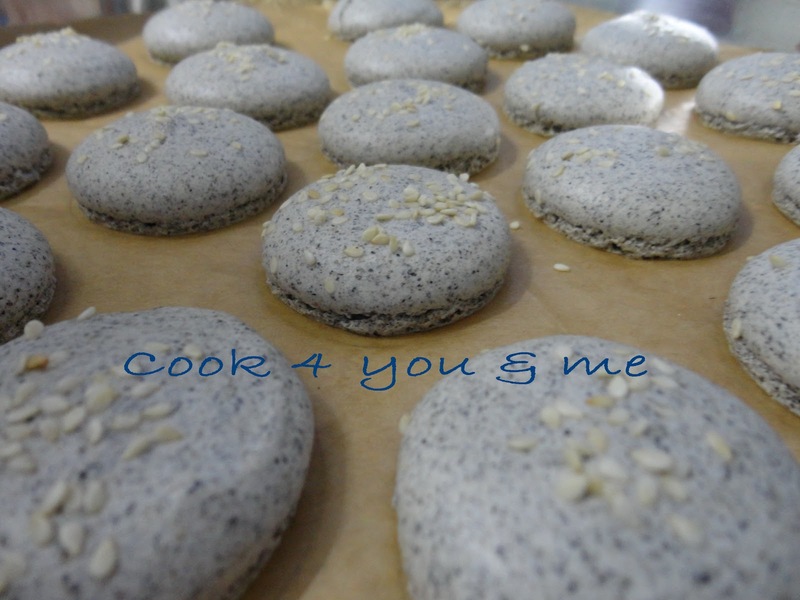 When i put them in my oven,i very scared.Don't know it success or not.Lucky it came out very nice...Taste very good too.The black sesame so fragrant. Plus this time i reduce 30g of sugar on the macaron shell.Because my friend and family say too sweet to eat.So,this time i try to reduce some sugar.Today i bring back to my office this macaroon.My colleagues love it.They'll say this time not too sweet.Nice to eat. 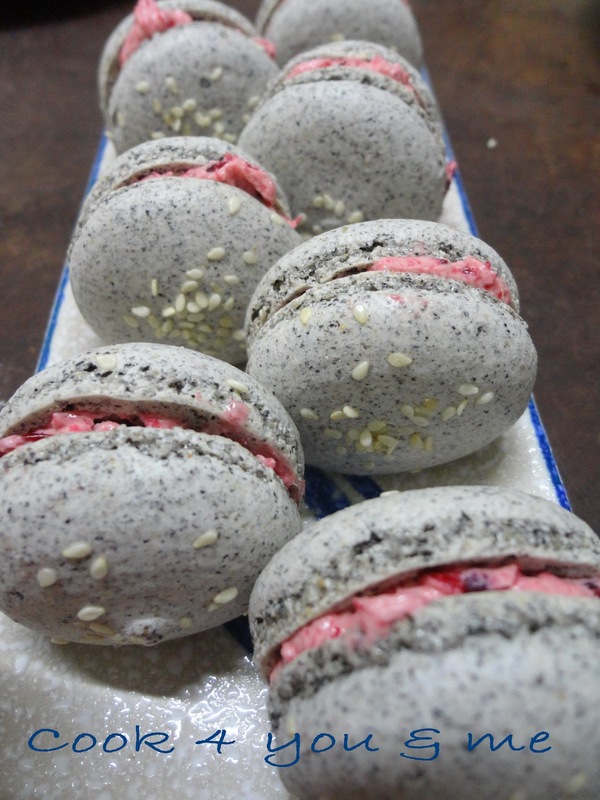 Sift almond meal and black sesame paste with icing sugar. Mix almond mixture with egg white and salt. Set aside. When the syrup reaches 105'c.Beat egg white until medium peaks. When the syrup reaches 118'c,pour the syrup into the egg white with beaters running on low speed. Beat meringue until stiff and glossy. Stir 1/3 of meringue into black sesame mixture. Pour black sesame mixture into meringue and fold ( remember don't stir it) The batter must look like cake batter. Put some white sesame on the top of the batter. Bake in the prepared oven at 150'c for 17 min. Peel the macaroon from the paper and let cool on the rack. 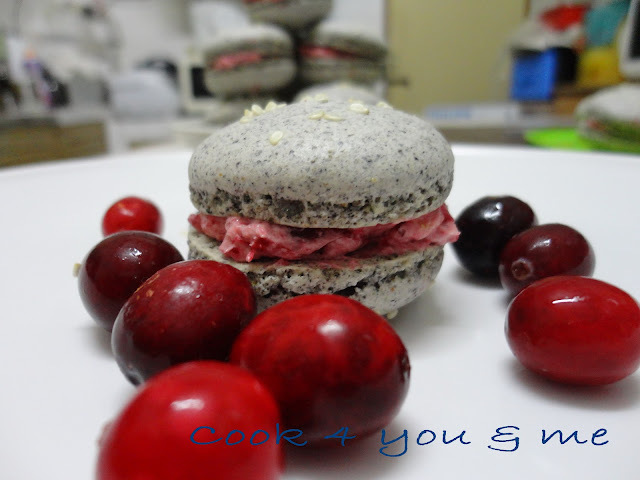 Place 1tsp of cranberry compote cream on the macaron and top with another macaron. Place covered air tight and keep in fridge overnight before serve. 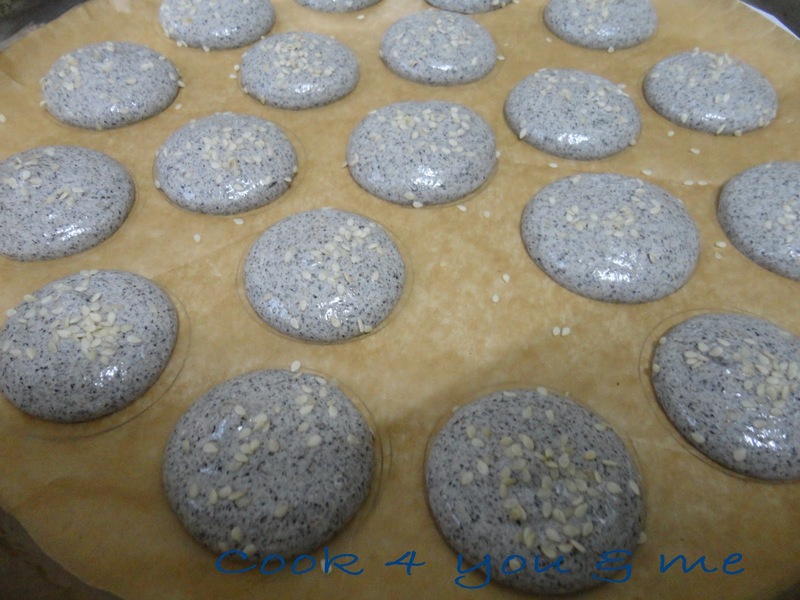 Before bake and after bake.My boyfriend say look like burger.Hahaha......My colleague say look like sesame ball ( the one we eat at Chinese New Year). Combine egg yolks & sugar in a mixing bowl, whisk until pale and thick. Transfer egg yolk mixture into a small saucepan together with the milk. Transfer above mixture into mixing bowl and whip with a electric whisk until pale and thick until you can draw a clear line on spatula. 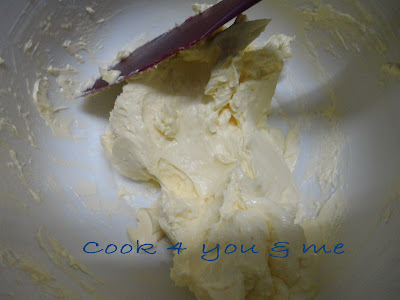 Add in softened butter in 3 batches and beat till thicken and hold its shape. Put cranberry,sugar and water in a pot.Cook in a low heat until the cranberry juice ooze out.Let it cool. 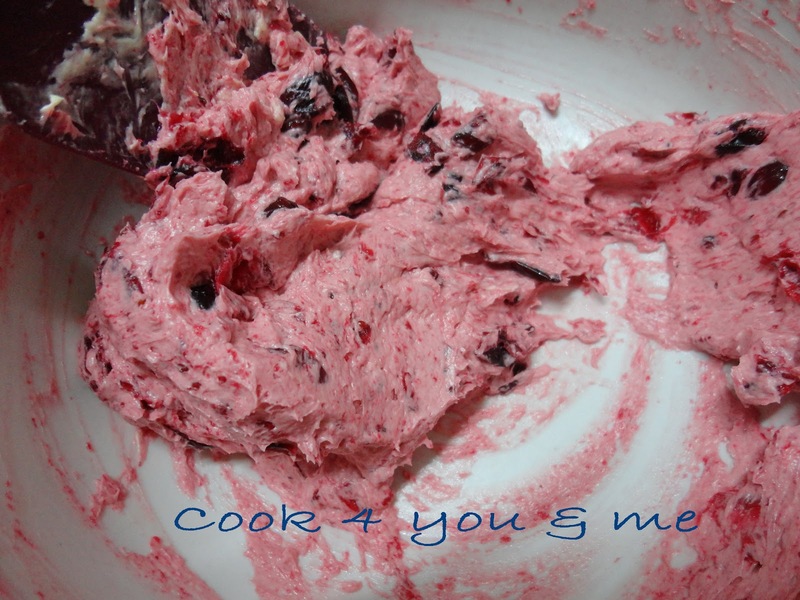 Mix the cranberry compote with the buttercream. I love your take with sesame seed. Hi Hody! 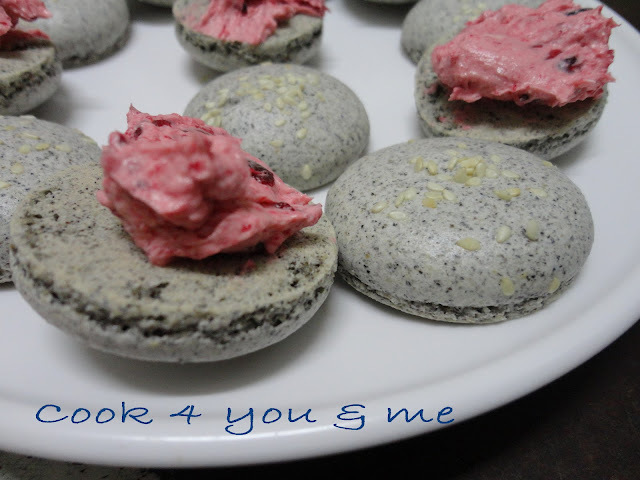 Congrats of your success and thanks for persevering through with your macaron making despite failures! Like what Wendy mentioned, your macarons are very pretty. :) I especially loved the contrast of pink against the ashy grey. 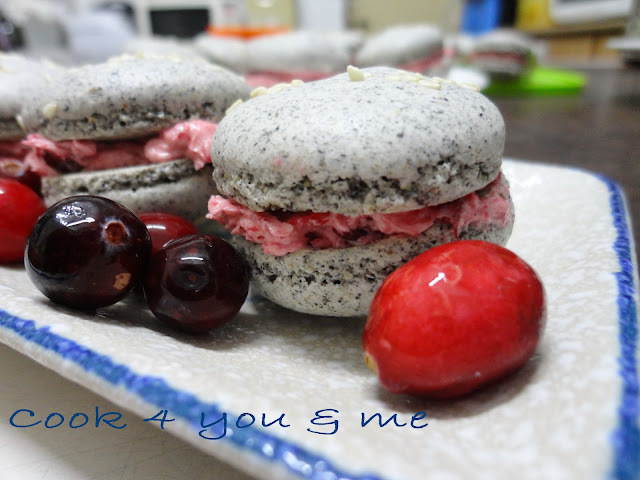 As with the sweetness issue you mentioned in this blog and your earlier one, I was thinking if you would want to try using a slightly sour filling to balance out the sweetness of the shell. Lemon, lime or passionfruit would work very well. OH yeah, one more thing, you might wish to change the word macaron to a single "o". 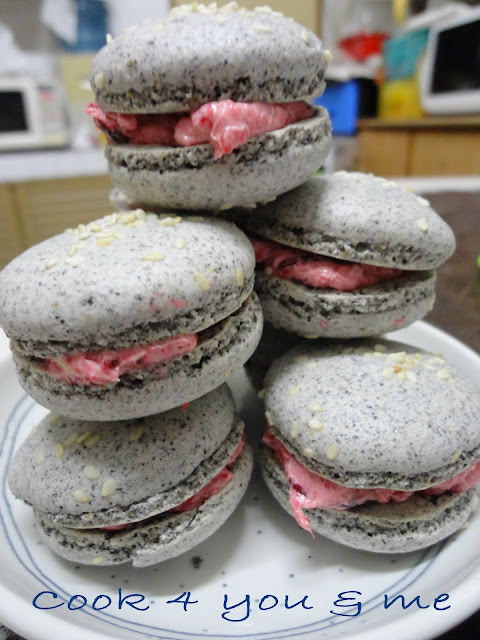 Macaroons usually mean something else altogether. Hody, this sesame macarons are very pretty and I really like the color combination. I am sure they taste good. How I wish I get to taste it someday. Hint! Hint! LOL! Have a beautiful Sunday my dear.